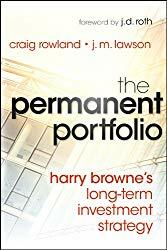 The Permanent Portfolio: Harry Browne’s Long-Term Investment Strategy, by Craig Rowland and J.M. Lawson, 2012, John Wiley & Sons, Inc. The Permanent Portfolio was first described in Harry Browne’s 1999 book, Fail-Safe Investing. According to Wikipedia, Harry Browne (1933 – 2006) was an American writer, politician, and investment advisor. He was the Libertarian Party’s Presidential nominee in the U.S. elections of 1996 and 2000. Rowland and Lawson do a fine job of expanding upon and modernizing Browne’s original work, covering modern investment choices that did not exist for retail investors in 1999, such as ETFs. The book does a very good job of describing the four economic conditions – Prosperity, Deflation, Recession, and Inflation – and how each of the four assets of the Permanent Portfolio combine in an optimal manner to produce consistent investment returns with very few down years (only six down years since 1978, the worst was 1981 at -5.3%). What are the four Portfolio assets? They are U.S. stocks, Long Term U.S. Treasury Bonds, Cash, and Gold. Although most investors are familiar with how to own U.S. Stocks (through an index mutual fund or ETF), fewer are knowledgeable about Long Term U.S. Treasury Bonds and unconventional options for owning Cash, like buying U.S. Treasury Bills instead of relying on banks. Fewer still know how to intelligently buy Gold and avoid getting ripped-off. The book explains how to deftly navigate the ownership of all of these assets, then how to maintain and periodically rebalance the Portfolio. Safety and security are discussing at length. The book discusses Basic, Good, Better, and Best levels of portfolio security, diversifying across institutions, diversifying across international borders, and how non-U.S. Citizens might implement something like the Permanent Portfolio. Tax planning is discussed. The in-depth treatment of the four basic Assets, which can be used as building blocks for many investment portfolios, and the recitation of The Sixteen Golden Rules of Financial Safety, make this a worthwhile read for anyone who is seeking a calm, quiet, deliberate alternative to the screaming, manipulative, talking heads on financial cable TV.